Step 1) Log in to Lattice. Step 2) Download Chrome Extension for Gmail (here). Step 3) Click into any email thread which involves an active Lattice user(s). Step 4) On the right side of your Gmail inbox, you will see the Lattice plugin - you are all set! 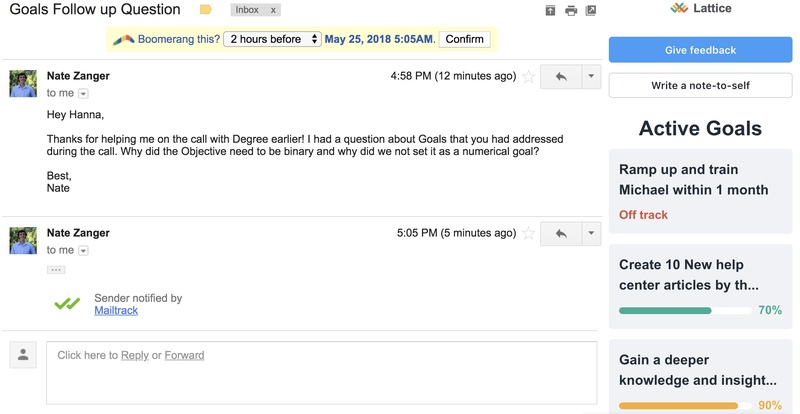 Once the plugin is installed and you are in an email thread, participating team members public Goals will appear in the Gmail plugin. You must be signed into Lattice to view goals. Your team member must be an active Lattice user for you to view their goals. If you are having issues, try logging in and out of both Lattice and your Gmail once everything is setup.